Although fans may fret when pros like the Nationals’ Bryce Harper get hit by a pitcher—and brawls ensue—some amateur athletes are the most likely to be struck and hurt: Ball-contact injuries are highest among female softball players, followed by women who play field hockey. That’s according to new research on thousands of college athletes that found that less than half of the female athletes’ injuries when hit by balls caused them to lose playing time. Most suffered bruises (30.5 percent) and sprains (23.1 percent). But concussions were among the most commonly recorded serious injuries, occurring in 16.1 percent of cases, with finger fractures an issue, too. When injuries were compared between men and women in baseball-softball, basketball, and soccer, female athletes had a larger proportion of ball-contact injuries diagnosed as concussions than did men, researchers found. They noted that helmets and face guards, can be helpful in reducing injuries, and, with growing concern across sports about the harms of concussions, they recommended that players, teams, and sports organizations and leagues consider requiring more protective gear. It may especially be called for in women’s lacrosse, where it is less used. The researchers’ call for greater safety considerations for young athletes was echoed in a new policy statement on baseball and softball issued by the American Academy of Pediatrics. The children’s medical specialists group said the games, played by almost 9 million youngsters annually in organized and recreational games, can be among the safest of all sporting games. But the pediatricians urged grown-ups to keep it so by maintaining fields, providing appropriate protective gear, and by ensuring that kids play the games in keeping with their skill levels and within the stresses and strains it can impose on young bodies. They warned that pushing young pitchers to throw too much, too fast and hard, and in the wrong ways can injure them—in the short- and long-run. Parents, coaches, and leagues should ensure that, as youngsters grow up and their games become more competitive and intense, that suitable medical care is available if it is needed. 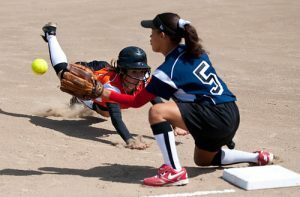 They noted, for example, that some young players are vulnerable to and had suffered cardiac arrest when hit in the chest by a ball or due to contact with another athlete. It can be treated successfully if the right equipment is nearby with trained personnel to use it. Children now get involved in various sports with such enthusiasm that we need to protect them with equal zeal. Their idolized pro athletes and their leagues, regrettably, may be hyping safety measures and programs more than they’re taking such efforts seriously and making them work in a way that would benefit the young. Head trauma and brain injuries are a very real and potentially life wrecking bane. We need to safeguard youngsters against them, as well as ensuring that we also don’t over-stress and injure our children by trying to fulfill our athletic dreams through them. Moderation matters. Let’s be sure sports stay safe fun for the young.